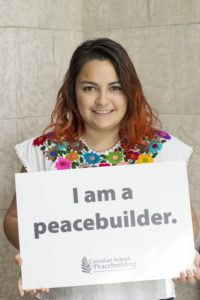 “I found out about CSOP (Canadian School of Peacebuilding) through CMU (Canadian Mennonite University) and everyone I knew. They all said it was a great program,” Andrea De Avila says. This was De Avila’s first connection to the Mennonite community. Later she attended Eastern Mennonite University (EMU) in Virginia, got married, and moved to Winnipeg. De Avila feels it is crucial to learn about peacebuilding and help people through trauma they experience through witnessing violence. This is exactly what Vicki Enns, Clinical Director of the Crisis & Trauma Resource Institute, and Wendy Kroeker, Assistant Professor of Peace and Conflict Transformation Studies at CMU, equipped students to do in their class. “I learned very practical ways of grappling with trauma and finding a centering point,” says De Avila. In her class, De Avila talked about the conflicts behind the United States election and how it related to peacebuilding. “Something that I reflected on in class was that there were two different ways of interpreting the last U.S. election. Something important to know about the CSOP program is that they do not have any biases on anything. When they discuss the 2016 election, they do not do it with an “anti-Trump” agenda … but rather they examine both sides and try to rationalize why people support Trump.” “On one hand there is hearing people's fears, and on the other hand, there was inviting people to listen to that discontent.” CSOP is very informative in terms of understanding why the world is the way it is and presenting it in a way that doesn’t have any biases. What Andrea learned through her CSOP studies will always be important to her, not just in her work as a pastor, but also in her understanding of the world around her.